1. Preheat the oven to 200°C, gas mark 6. Heat 1 tbsp oil in a large frying pan and fry the onions for 3-4 minutes, stir in the sugar and vinegar and cook for 8-10 minutes until caramelised. Meanwhile, mix the mayonnaise and both mustards and set aside. 2. Bake the ciabattas for 5-6 minutes and then slice in half lengthways. Brush with oil and griddle for 1-2 minutes until golden. Brush the steaks in oil and season, then griddle for 1 minute on each side. 3. 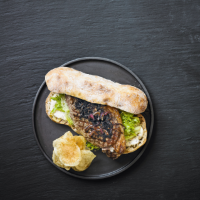 Spread the ciabatta bases with mustard mayonnaise and top with salad. Place the steak on top and spoon over some of the onion marmalade. Serve with crisps, chips or salad, with extra onion marmalade. This recipe was first published in Thu May 12 13:00:00 BST 2016.